There are dreams that produce terror and dreams that change the shape of the environment. This video explores the roots and a warfare strategy for each. Cost includes 428 days of access after purchase date. There are three common flavors of terror dreams: generational covenants, death spirits or simply floating terror. There is another category of dreams where your environment changes. You are moving toward an open door and when you get there the door is gone. In this video, Arthur explores the possible causes of all four kinds of dreams and, for each one, does specific spiritual warfare to close the open door. Holy Communion is additional warfare regarding the thoughts and your mind at night. Essential truth to clease and restore your dream life. I'm a dreamer and have studied and ministered for years as a Master Certifield dream interpreter trained by John Paul Jackson at Streams Miistries. This teaching is a must for anyone who wants to receive revelation in the night season, but has been blocked by the terror of the enemy. Have you or your loved ones ever experienced night terrors? Night visitors? Demonic paralysis where you can't say the name of Jesus? Genrational covenants? Nephilim? Structures in the brain blocking your ability to receive? These are all covered. But better yet, the causes and solutions. the provision we have ....access to the heavenly courts, our rights and design for unencumbered freedom thru the blood of Jesus is fully explained and leveraged in a time of prayer for deliverance and restoration for you, your children and your children's children to a thousand generations! If you our the ones you love have been tormented. Do not delay in watching this video! Freedom is yours for the asking! Thank you Arthur for this gift of truth, revelation, empowering and hope! This teaching explores not only dreams in the way we usually might think about it, but also demonic visitations at night the way children experience sometimes. I found this fascinating, exciting and spot on! This is new, fresh and very helpful! I love the warfare, and new freedom with extra tools in the toolkit! 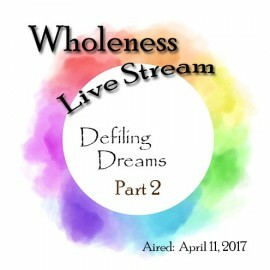 I was anticipating the teaching on Defiling Dreams and I was most interested in shape shifting. I had an idea about it, but that wasn’t what was taught, which is always fine! I was so very interested and grateful for Arthur’s authoritative prayer about Nephilim, and the confirmation he brought. The timing of God is always perfect. Just that day, I was dealing with this creature (DIY brain deliverance) and had no name for it. I knew that it has something to do with identity (courtesy of a word from the Holy Spirit) and it did not seem to be in time or dimensions, in other words it couldn’t be pinned down. It also liked being worshipped. All new observations for me. So I just started telling this “something” of my identity in God. This had been going on for years: my perceptions of what I was seeing in the spiritual realm were often being challenged and were not mine, so frustrating. Now I feel like my brain is feeling closure, like my brain has had an exciting cleansing and healing. I was so excited about this! I am excited to have hope of seeing what God desires me to see. I was so thrilled that Arthur extended his prayer for dreams and visions for Muslims. Do you look forward to sleep and dreams? God designed dreams to be a treasure. The enemy has warped them to be a source of torment. Here are some additional tools to fight back.